Summer has come and gone, but that doesn’t mean you can’t still enjoy firing up your grill and enjoying a delicious BBQ under the warm sun and cool breeze of LBI. Introducing the Big Green Egg: the missing ingredient in your BBQ formula. What is a Big Green Egg? The Big Green Egg is a ceramic kamado-style charcoal grill based on an Asian design for clay ovens that is more than 3,000 years old. The unique design and high quality construction of the Big Green Egg make it an incredibly versatile grill that provides limitless ways to prepare your BBQ feast. 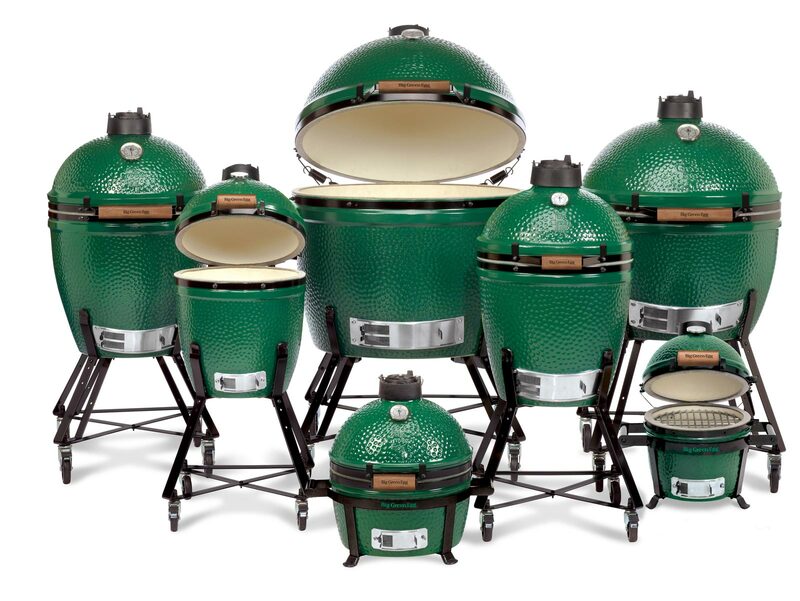 What makes the Big Green Egg different from a traditional propane or charcoal grill? Two words: temperature and versatility. The Big Green Egg provides all the same functionality as your standard charcoal or propane grill, but the EGG separates itself from the pack because it can achieve incredibly hot temperatures that traditional BBQs can’t touch. The Big Green Egg makes it easy to cook at precise temperatures. The simple air flow system and accurate thermometer give you total control over temperature, maintaining accuracy within a few degrees! The Big Green Egg is not just a grill. It is a grill, oven, and smoker all in one! With the addition of an accessory called the convEGGtor, the Big Green Egg can bake bread, pizza, casseroles, cobblers and pies better than your kitchen oven! The unique ceramic design of the EGG enables it to retain heat and moisture, meaning your food won’t dry out and the juicy flavors will stay locked inside. The coolest feature of the Big Green Egg? It’s ability to smoke meat slow and low until it is fall-off-the-bone perfect! The design of the Big Green Egg allows you to precisely control the temperature even at low heat. You can maintain super-low temperatures between 200 – 350F for up to eighteen hours while infusing your food with the delicious, natural lump charcoal flavor. How do you incorporate the Big Green Egg into an outdoor kitchen? The Big Green Egg’s design is so captivating and unique that we love to make it one of the focal points of our outdoor kitchens here at Bay Avenue Plant Company. While it can stand freely, the circular, compact design enables the EGG to be neatly recessed into a countertop or table. The Big Green Egg is manufactured with the highest quality materials, allowing it to withstand the salt air and harsh outdoor environment on LBI. Unlike regular grills that are often made from metal, the ceramic of the EGG is completely resistant to salt damage and corrosion. There are 7 sizes of EGG from mini to 2XL! Bay Avenue Plant Company is a licensed distributor of the Big Green Egg, giving us access to the full line of sizes and every “EGGcessory” that you might need for the ultimate grilling experience. If you’re looking for a new grilling option, we can choose the EGG or EGGs that work best for your space and integrate them seamlessly into your outdoor design for you and your family to enjoy.